Golf balance aids and training gear serve to improve a player’s body posture, giving it the tuning it needs to separate the player and to increase their level of play. Do take note that balance rods will purposefully force players to shirt their weight on to their legs for support rather than their spine through force of habit. Now the secret behind being able to hit a ball far and accurate enough lies in the shifting of the player’s core before and after the swing. That is why these tools are great at improving player’s core by aligning it properly for a greater balance and allows players to develop a stance that is dynamically athletic. The EyeLine is a great tool that serves to improve a player’s body posture, giving it the tuning it needs to separate the player and to increase their level of play. Do take note that the balance rod will purposefully force players to shirt their weight on to their legs for support rather than their spine through force of habit. The secret behind being able to hit a ball far and accurate enough lies in the shifting of the player’s core before and after the swing. This tool is great at improving player’s core by aligning it properly for a greater balance and allows players to develop a stance that is dynamically athletic. Perfect Balance Golf: Your Key to Consistency and Shot-making in Golf is heralded as a ground breaking golf swing system that integrates the key fundamentals of balance, pivot, and drive into a highly dynamic and effective golf swing motion. Based on key discoveries in golf on the role of balance and pivot in the golf swing by golf educator, performance advisor, and former PGA Tour instructor, Bob Cisco. Often described as a revolutionary tool that aims at improving a player’s natural ability to shift their weight before and after a swing, it successfully acts on that by allowing players the opportunity to understand the fundamentals of weight adjustment and balance when addressing the ball on the ground. 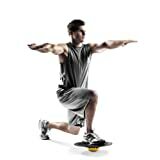 Use the Balanz Disc to improve balance and intensify workouts. It allows for strengthening and toning of large core muscles as well as smaller muscle groups. The ergonomic design encourages proper posture while standing, kneeling, or stitting through low-impact strength training. Easily inflate or deflate to match your ability or challenge your balance. Improve balance and core strength by using the Balanz Pad with any seated or standing exercise. It destabilizes the movement to further engage your core and get you working harder. 2.25" thick, measures 18.5" x 16.5". Destabilizing properties enhance balance and core strength training. Perfect for seated or standing rehabilitative and proprioceptive exercises. Easy to clean, water-resistant closed-cell foam. Textured slip-resistant surface. The Balanz Board tilts and rocks to challenge your balance and overall coordination. Train on this board and you will improve core strength, stabilizer muscles, and your body and spatial awareness. Great for push-ups, lunges, and other balance exercises. The Balanz Board Pro is ideal for proprioceptive and rehabilitative exercises that help to develop joint strength and mobility. It also aids in developing muscle control, balance and coordination.